Editor’s Note: This article first appeared on the Gong.io blog here. What makes your top-performing reps so good at selling? Maybe you think every great rep has something different going for him or her. 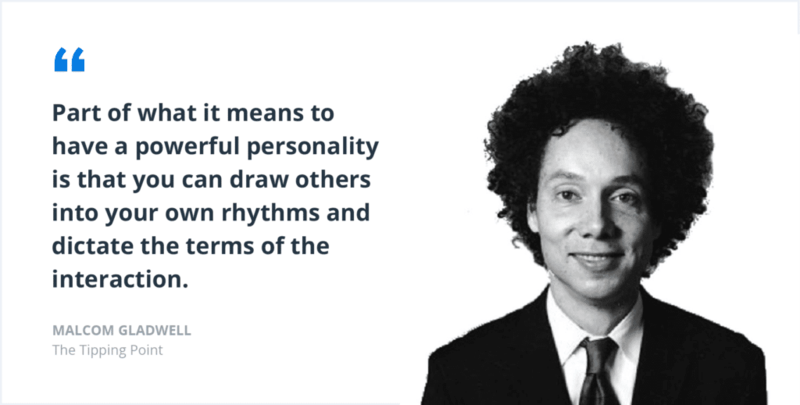 One is fantastic at building rapport, while another is a skilled negotiator. Both of those theories are popular among sales managers. However, neither are true. There’s only one thing dividing your rainmakers from their less successful peers: Their sales conversations. We used A.I. to analyze more than 1 million sales calls, and here’s what we found the best reps doing again and again. It’s common wisdom in the sales world to “mirror” your prospect — in other words, subtly imitate their way of speaking, tone, and body language to make yourself seem similar, and thus, more trustworthy. Yet it turns out the most persuasive salespeople actually use the opposite approach. Rather than copying their prospects’ talking speed, they get their prospects to copy theirs. 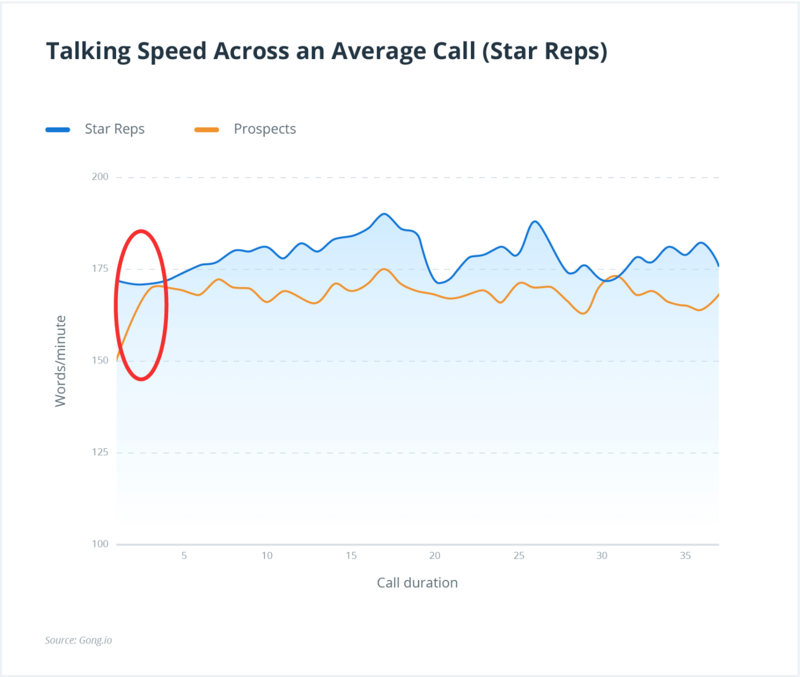 Top salespeople get customers to adjust their rate by 13% on average, all within the first three minutes of the call. Average performers, on the other hand, adjust their speed by 7% to meet the prospect, while the prospect barely changes. The same trend holds for “sentiment” patterns (i.e., how positive or negative someone’s language is.) Top reps don’t become more or less positive to match their prospect’s sentiment. On the contrary, their prospects become more or less positive to align with them. 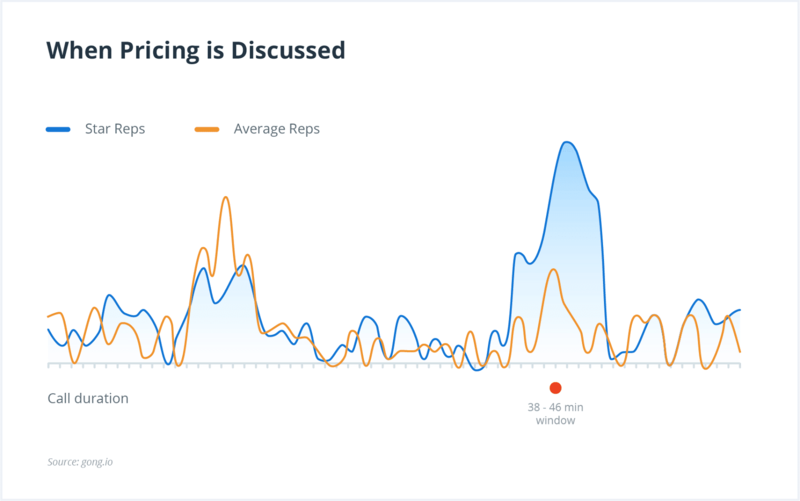 When reps discuss certain topics, it can have a big impact on their win rates. Especially when it comes to pricing, which is often one of the most loaded parts of the sales call. It turns out star reps all tend to bring up price at the same time: in the 38 – 46 minute window. This makes sense – waiting until you’ve established the value of your solution usually leads to more favorable terms. Not all words are created equal. 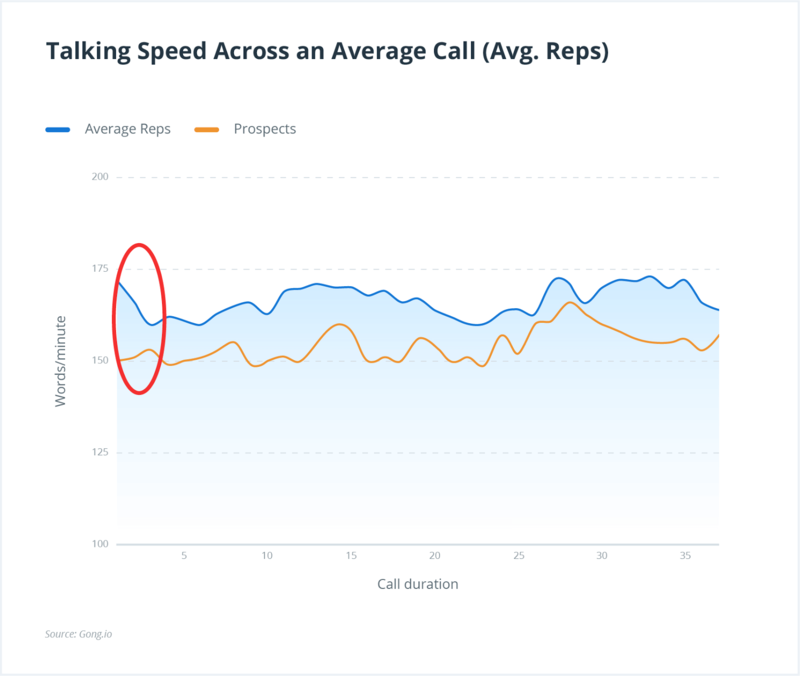 There are seven words that we’ve found high performing reps use on call after call. Successful: Who doesn’t want to succeed at their job or in life? This term is incredibly compelling to potential buyers. The prospect’s name: Everyone loves the sound of their own name — it makes them feel important and respected. Decisive language: Words like “definitely,” “certainly,” and “we can do that” demonstrate confidence and make the salesperson seem more authoritative. Risk-reversal language – or statements that put prospects at ease like “We offer a 30-day no obligation trial — also improve win rates by 32%. The truth is, selling is far more about listening than talking. 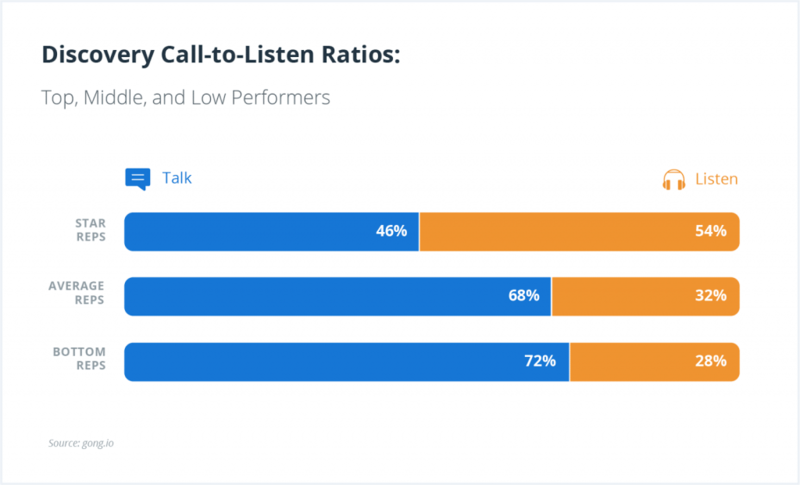 Top performers boast a 46:54 talk-to-listen ratio, meaning they speak less than 50% of the time. 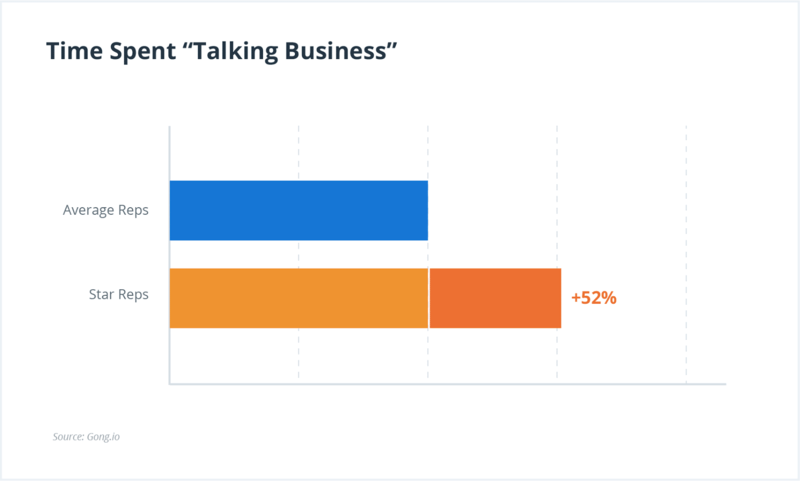 Average performers, by contrast, talk 68% of the time. And low performers speak even more — a mind-numbing 72% of the conversation. 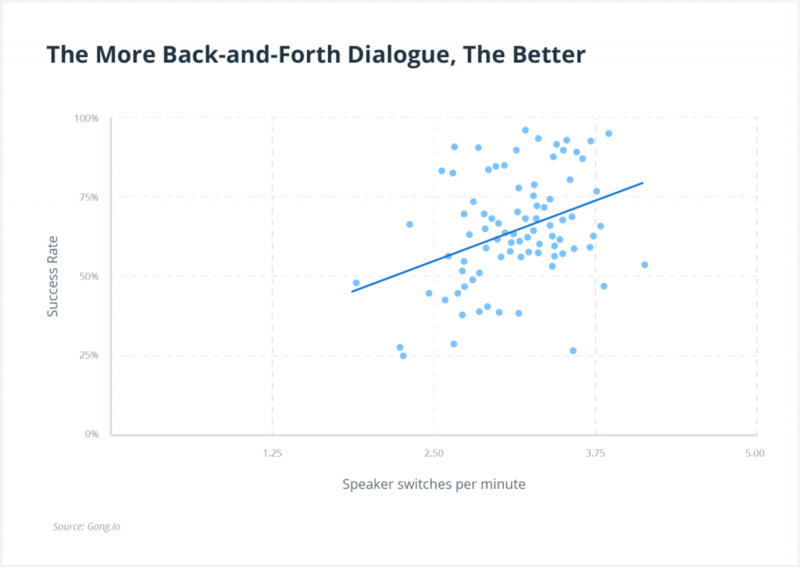 By letting customers speak up more, and not jumping in as soon as they pause, reps discover valuable information, forge stronger connections, and avoid rambling or talking themselves out of a deal. No one likes feeling like a suspect in an FBI investigation. Especially when they’re trying to evaluate a B2B solution. The data backs this up. Top salespeople engage in back-and-forth conversations rather than throwing question after question at their prospects. When reps and customers frequently take turns speaking, the chances of a second meeting increase. This data point might seem counterintuitive. 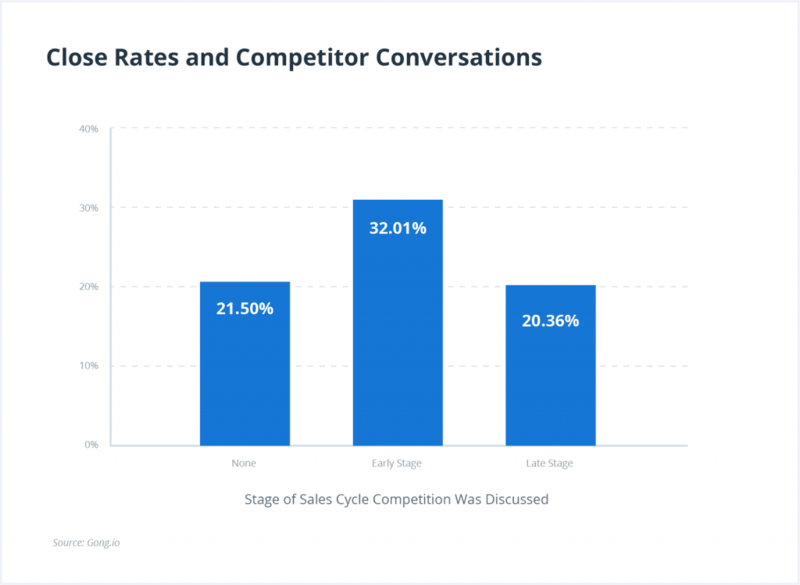 If the competition is discussed early in the sales process (think the first 1-2 stages), the deal is 49% likelier to close than if the competition never came up at all. 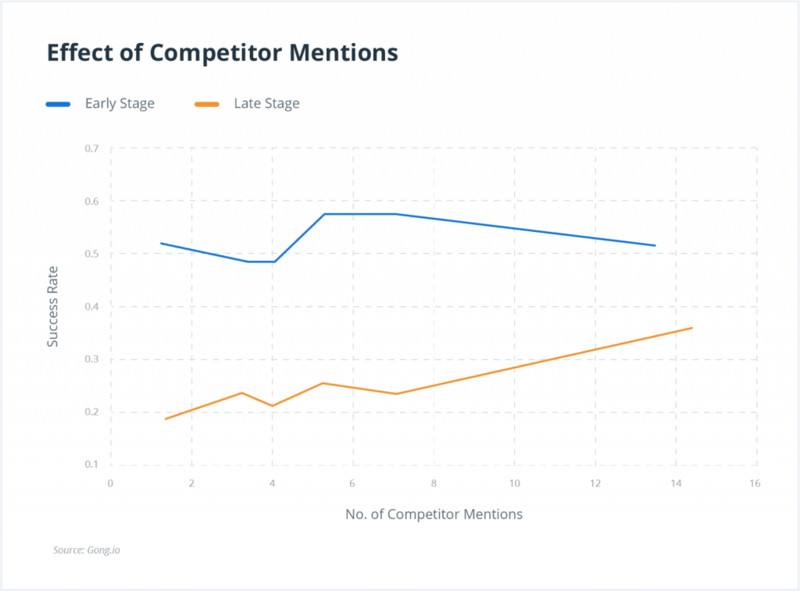 This is because you’re winning the competitive war early on – while the prospect is still forming their conclusions. The opposite effect occurs if the competition comes up in the middle or end of the sales cycle: the odds of closing go down. That’s why the best salespeople make it a point to ask “Who else are you considering” early on, so they can get ahead of their competitors. Lone wolves don’t prosper in sales. 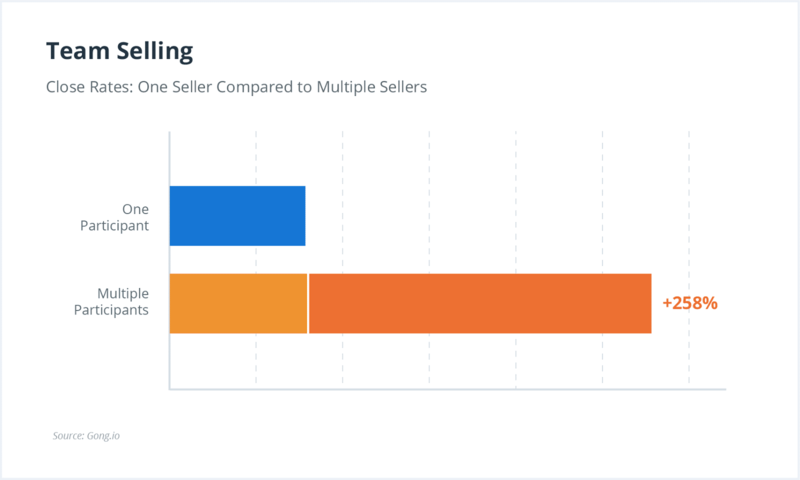 Deals that contain just one sales call with multiple participants from the selling organization are 258% more likely to close than deals where the rep flew solo during the entire sales cycle. In other words, team selling works. For that reason, top-performing salespeople are in the habit of recruiting their CEO, sales manager, sales engineer, or other relevant stakeholder to join them on their sales calls. After all, this tells the prospect the rep is “all in” — and also lets them deepen their understanding of the product and vendor. The reps at the top of the leaderboard spend more time talking about business- and value-related subjects than average performers. A lot more – to the tune of 52% more time. 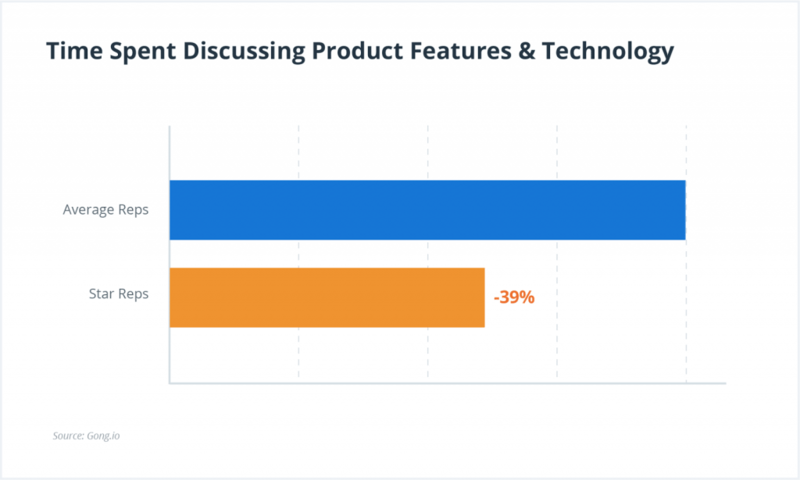 They also spend 39% less time talking about technical topics and features. 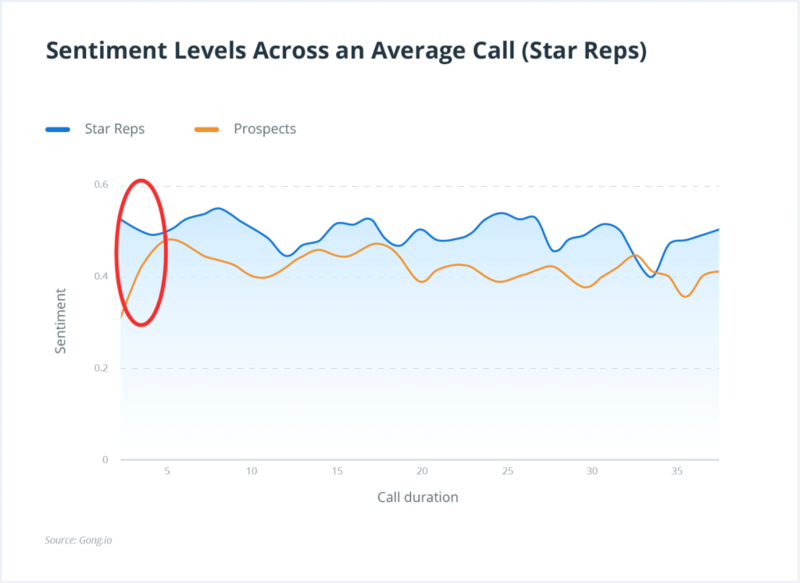 If your reps are getting a ton of questions during their demos, that’s a very good signal. 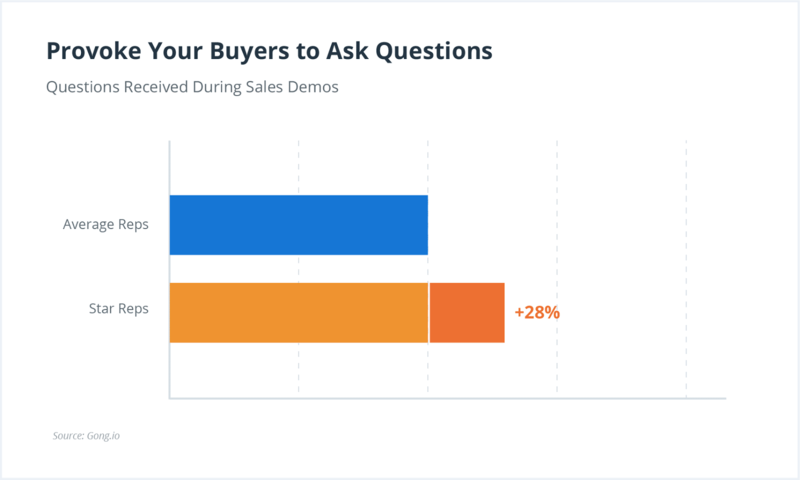 Top performers get nearly one-third more questions from buyers during product demos than middle of the pack performers. And these reps also ask 30% fewer questions of their buyers during demos. Why? They’re giving prospects just enough information to spark their curiosity. Just enough to provoke questions. Then prospects ask questions about what they’re interested in…which nicely focuses the conversation and guarantees they’re engaged. 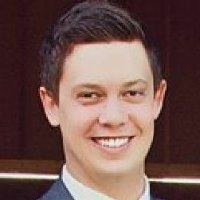 This technique lets the best reps keep their demo hyper-focused to the topics each buyer cares about. Well, there you have it: 9 secret elements of highly effective sales conversations. Each of these nine elements actually has multiple data points supporting it further that go beyond the scope of a single blog post. We couldn’t include everything here. So we packed all of that fascinating data into an ebook that you can download for FREE.